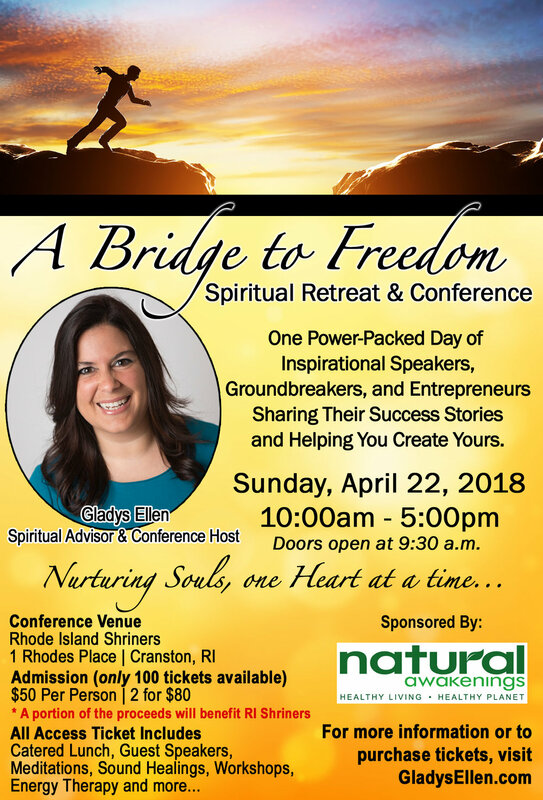 Please join us on Sunday, April 22, 2018, at the "A Bridge to Freedom" Spiritual Retreat and Conference. It is being held at the Rhode Island Shriners and only 100 tickets are being sold. Click here for more information. My friend Gladys Ellen, angelic communicator and spiritual advisor and founder of Heavenly Hugs, has organized this event as an intimate day of inspiration, motivation, and hugs (of course). Why Did the Creator Choose to Make Us? Why did the Creator choose to make us? Why did the Creator choose to make you? Because “the Creator is gaining in knowledge and appreciation of Itself. The Creator wants to know Itself,” but cannot truly if it is by Itself. Therefore, it sends forth parts of Itself into this illusion to see what will happen and to learn from the enormous tapestry created in the brightly colored and golden threads of emotions that you have created through many experiences and incarnations. This tapestry contains your unique beauty and the light in the way only you can shine. It is in that way that you teach the Creator that which no one else can. And by “no one” that means no other being in all of Creation is able to teach the Creator what you can. None. Not one. Consider the vastness of this universe. Creation is made up of an infinite number of universes. You are the only one of you in all of the unending multiverse. So, my friend, what the Infinite Creator greatly desires is your gift, your tapestry that comes from you. This site is a collection of my personal insights. This is what I have learned throughout my spiritual journey and what I believe. I offer it to you for your own spiritual journey. This site is not a mandate on what everyone should believe. This is not an attempt to start an organized religion or belief system filled with dogma. This is not an attempt to start a cult following. Every soul is on its own journey. Every one of us has the power to decide for ourselves what we believe, what we think, what path we should take. I offer this to you as food for thought.